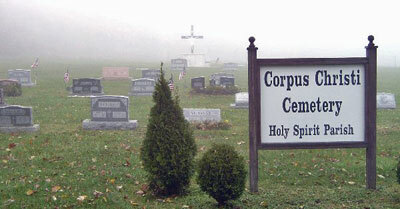 Corpus Christi Catholic Church Cemetery is located on State Route 2003 (Dunlo Dip Road) between the towns of Dunlo and Beaverdale. There are two sections to the cemetery. The old section of the cemetery is located on the left hand side of the road between St. Peter and Paul's Byzantine Catholic Cemetery and the Dunlo United Methodist Church Cemetery. The new section is located behind the old section across the dirt road to the right of the water tower. Corpus Christi Church has been consolidated into the Holy Spirit Parish which is made up of these three churches Corpus Christi Church, St. Agnes Church of Beaverdale and the St. Joseph's Church of Beaverdale. The Corpus Christi Church of Dunlo and the St. Joseph's Church of Beaverdale are still in use today.